>I do talk about the weather a lot – but not because it’s filler for a lapsed conversation. Michelle mentioned in her comment to my Leaves Leave, Fall Falls post that in her part of Australia the traditional culture conceived of the year encompassing six seasons. I’m drawn to ways of thinking that push boundaries, and I like to consider that there may not be four set seasons as well. Here, I usually just think we have two, though there are other changes manifest through the year. In some ways we seem to only have Dry and Rainy seasons. Rainy is the start of the new year – usually about now (in fact it’s started to rain in the last week or so and everything I said about dry heat is now over). It straddles the months of (approximately) November through April, though rains extend sometimes from October until June as they did this past year. But by Rainy, I don’t mean a monsoon season – just that we might get rain. Dry, then, is the complementary side of the circled-year: May/June through October/November. That’s the supporting structure of our “small seasons” – the ones that look like April’s winds that dry the long wild oats to a silvery golden green and give “horse-waves” to the hills; or the still warm “autumnal” days with a few drifted-in-from-the-coast showers. This season now, of the leaves still shaking on the trees and a last few, warmer, short-sleeved days is different from January’s long grey sunless stretch. 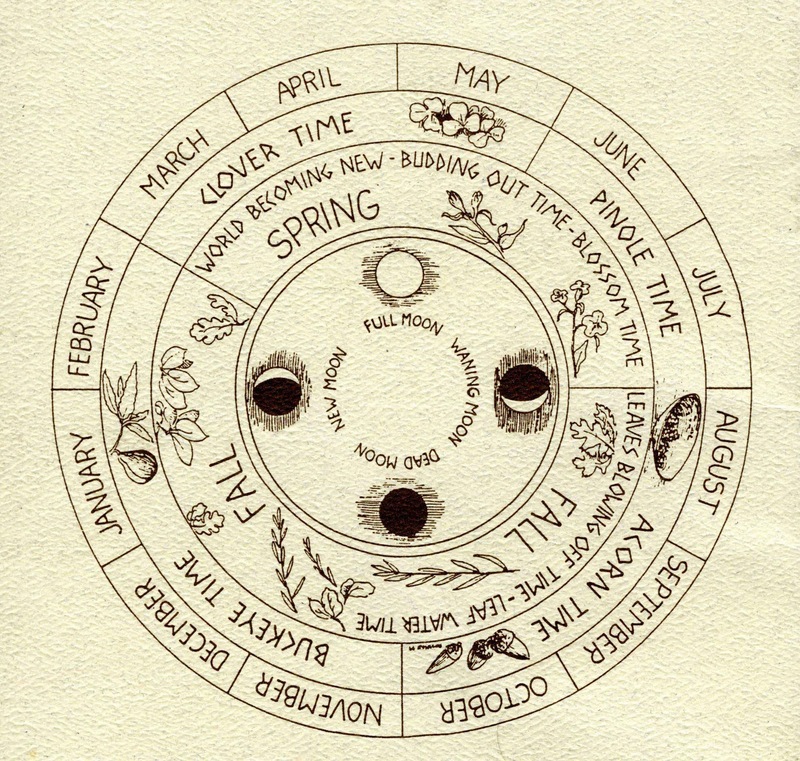 The other day I came across a booklet I picked up at Bothe-Napa Valley State Park – the graphic comes from a study called the Warm Springs Cultural Resources Study, and shows the local conception of the seasons and how certain plants are indicative of seasonal changes. The area from which this information came is about an hour and a half drive to the west from where I live – still linked and similar to my region, but different in topography and regional details. It’s interesting to note that for the native people of that region, the calendar was less about weather and more related to the harvest. In yesterday’s poetry workshop I was introduced to a East Wind Melts the Ice by Liza Dalby who used the traditional Chinese 72 divisions of the year to write a memoir that is engaged in seasonal changes. I’ve not read it, but I’m interested to, to see what Dalby, who also lives in northern California, can pull from other traditions to relate to this particular place. I think one of the reasons I’m so interested in seasonal variations is that this awareness makes me feel more connected to a place where, honestly, I don’t exactly feel at home. I’m not native to this huge Sacramento River valley and I haven’t really come to love the place as it is: developed, flattened, ugly sometimes. In town there are shade trees and so I can’t see the hills. It’s like living in a bowl a little bit – or an extremely large serving tray. I’m originally coastal, from a small open valley that leads to the Pacific but where you can always see hills around you, except to the west where it opens to the ocean’s haze. Like this area, my hometown region was heavily agricultural and so there was little left in the way of native plants in the immediate vicinity. But I could ride my bike out of town a few miles and smell the sage and dry grass and wetlands’ willows and then the salt air. The fact that I don’t absolutely love the place where I live is a bit of a challenge – I want to love it. I want to live in a place I feel attached to, that feels like home, that is find-able. Maybe under the paving and buildings and tractor-flattened fields there’s still the pulse of this native place, but I only can find that out at the creek – which is not wild but still retains some wildness. So I keep trying. Also, since I filter (if that’s the right word, though I don’t like that it has the connotation of changing that which is filtered)… anyway, since I filter a lot of my experience through the lens of writing, and I have long known that my writing is strongly rooted to land, I tend to be drawn to the intersections of those topics and how they relate to health and creativity and mutual relation with other species. Today I’m going to get out my G.O.T.S. planning notes and see what I can do to immerse myself in the story idea again. I had a realization the other day that part of what fizzled the project for me (aside from the fact that I can’t write when the kids are home all day in the summer) is that I’d originally situated it in Stockton (Stockton!!) which is an area I don’t even have the remotest affinity with. I was trying to make it kind of local, offer something to the region in a way — but honestly, it’s not an area that inspires me, poetically, and even though this is fiction, if I can’t find poetry in it, it’s just not going to work. So I thought about the places I love around here where the premise of the story could still work, and I realized that in spite of my definite rural tendencies, I love San Francisco and having gone to school and worked there, it’s a place I know far better than Stockton. So, the idea is in flux – I may be moving the setting of The Golden Orb of the Sun to San Francisco. Just the thought makes my Muse-mind happier, so this could be a good thing. Ok, I’m off. If I don’t crack the mental whip, it’s never going to happen! So I have 5 days to decide if I feel confident enough to engage in this year’s NaNoWriMo. Perhaps you aren’t familiar with the crazy things writers will do to push out yet another page, paragraph, or word, and National Novel Writing Month hasn’t crossed your path. If that’s so, then you’ll be unknowing no longer. NaNoWriMo is 30 days (always in November) of writing mania. The goal is to write 50,000 words in those thirty days (averaging 1667 words per day). There’s no stipulation on the quality of the writing, only that it be 50,000 words of an original novel-length work undertaken between November 1 and November 30. The program website has tons of information – forums, worksheets, advice, pep-talks, and just all around good cheer. In addition, there are regional write-ins and people buddying up to spur each other on with things like word wars (to determine who can write the most in a set amount of time) and plot/character/scene adoptions. As I’ve mentioned before, I did NaNo in 2008 and ended up with a 112,000 word manuscript. Owl, who was then in 7th grade wrote 80,000 and Kestral, a first grader, wrote 10,000. I skipped it last year because we were moving and now I find November is again fast approaching. And that means that I have an opportunity to kick procrastination and resistance out of the immediate vicinity and dive head first into a fit of mad typing that, on a good day, leaves my inner critic in the dust and puts me closer to a real, finished, story. I’m hanging back only because I know the reality of daily life – but I’m also remembering that 1667 words (or thereabouts) only took about 1.5 hours a day when I did NaNo last time. I think I’ll leave it to the last minute to decide – but meanwhile I’ve gotten my planning notes for G.O.T.S. out and have been thinking about how to jump-start my enthusiasm for the story (none of the work I’ve done for this story can be counted for the 50K, so I’ll be starting over, which also gives me an opportunity to re-think some of the story line). I’ve been looking to see if there’s anyone I could buddy up with (as feeling like I’m doing everything alone is often a huge hurdle) and that may just tip the balance. As of today it seems I might commit – but I’m even non-committal on the report of whether or not I’m committed….